Apple Compressor is a powerful program for compressing your media files. Most of the time, you can get by using a few presets. But not always. This week, join Larry Jordan as he showcases many of the advanced features in the application. DOWNLOAD NOTE: After you complete the store checkout process, you will see a Download Link on the Order Confirmation page. This link allows you to download the product to your computer. You are given four attempts to download the file. This title is a download only. NOTE: Webinar 251 covers the basic features and operation of Apple Compressor. Sometimes the only thing standing between you and getting a job done is a lack of knowledge. This week, learn the hidden tools in Apple Compressor to get your work done faster. This is an advanced-level session. Some knowledge of Apple Compressor will be helpful, but not required. 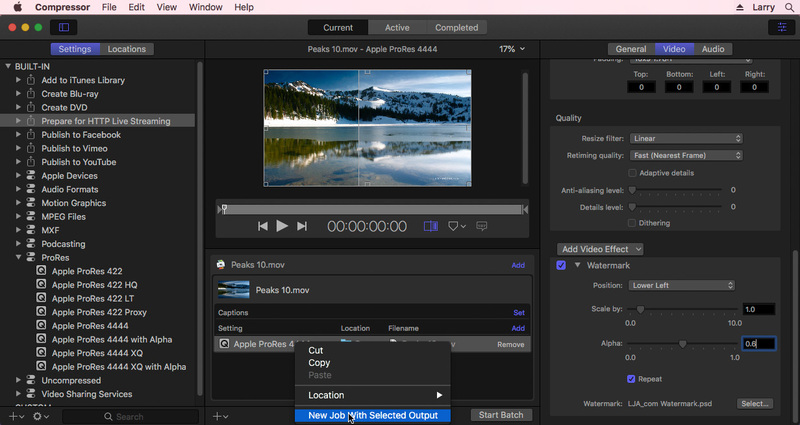 To help you quickly find the information you need, we included chapter markers in the downloaded QuickTime movie for easy navigation. Click here to learn how to display them in your download. – What is an Image Sequence?